GRAND RAPIDS, MI â A $25,000 necklace submitted as an ArtPrize entry is at the center of a competition among three local charities. Whichever one gets the most online votes will receive 80 percent of the proceeds from the sale of the necklace, which will be auctioned on eBay. The runners-up will split 20 percent of the proceeds. Voting begins today at grandrapidsgem.com. Supporters may submit a single vote daily. The necklace, named “The Grand,” combines strands of white gold and 117 white, blue and teal diamonds to evoke the Grand River and the city’s skyline. 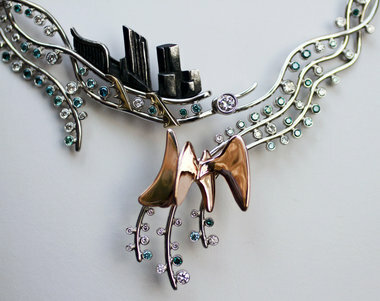 At the center of the necklace, the shapes of DeVos Place, the Amway and the Marriott are created in silver that has been oxidized to a dark color. A Calder is shaped in rose gold, and two yellow-gold bridges stretch across the necklace river. An independent appraiser valued it at $25,000 said Craft Revival co-owner Jayson Case. The piece will be displayed during ArtPrize at Craft Revival, 16 Ionia Ave. SW. The store is an ArtPrize venue that is also hosting works of two other artists. Case said craftsmen spent more than 100 hours creating the necklace.